This new book is the product of a unique research, teaching, and exhibition project at the Academy of Fine Arts Vienna. Faculty and students of the university’s Institute for Art and Architecture IKA dedicated a full year to investigate the highly controversial modernist architecture of the three decades between 1950 and 1980. Their goal was to assess the state and current use and to interpret the aesthetic, history, and public acceptance of four selected buildings from today’s perspective. Eventually, the students created designs and proposals for moderate to radical changes for these structures. The surprising results of this undertaking offer a very differentiated picture of Vienna’s General Hospital (AKH), the Austrian Broadcasting Corporation’s studio complex (ORF-Zentrum), the Vienna University of Economics (WU), and the Alterlaa housing estate. Big! Bad? 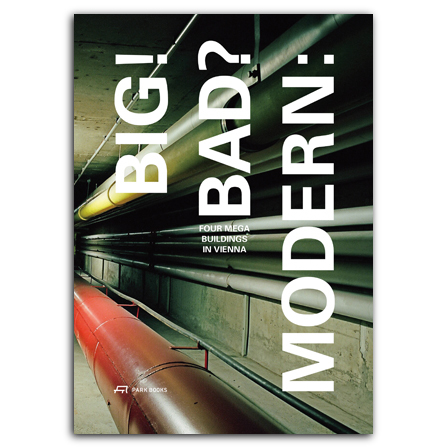 Modern: reflects this diversity: Arranged by keywords derived from the featured projects, it provides easy access to the rich and comprehensive collection of materials and manifold positions, and opens up new perspectives. Essays by renowned authors such as Hermann Czech, Françoise Fromont, Harry Glück, Sabine Kraft and Michael Zinganel and a preface by Nasrine Seraji round out the book. , born 1936, lives and works as an architect and architectural publicist and critic in Vienna. He has taught as a visiting professor at University of Applied Arts Vienna, (1985–86), Harvard Graduate School of Design (1988–89 and 1993–94), ETH Zurich (2004–07), and Technische Universität Wien (2008–09), and has published widely. is an architect and pricipal of the Vienna-based firm STUDIOGRUBER. He is also a Professor of Architecture at the Academy of Fine Arts Vienna. teaches in the departments of architecture (IKA) and art education (IKL) at the Academy of Fine Arts Vienna. She studied architecture at the University of Stuttgart and the University of Applied Arts Vienna. is an architect and co-founder of Vienna-based schmidt-colinet.schmoeger architects. She is also a senior scientist and deputy head of institute at the Academy of Fine Arts Vienna's department of architecture (IKA). is a Professor of History and Theory of Architecture and of Design at the Academy of Fine Arts Vienna. She has been editor of ARCH+ magazine for many years and has also taught at various universities in Germany, Austria and the Netherlands.